Description	 MS in Latin, Anglo-Norman, and Middle English on vellum, London?, England, ca. 1445, 274 ff. (-14), 36x25 cm, single column, (23x15 cm), 36 lines in current English book script by 2 scribes, headings in red in a formal English book script, signed by Ricardus Chetylbere, large blue initials with red penwork decoration, 2 drawings of 16th c.
Binding	 London, ca. 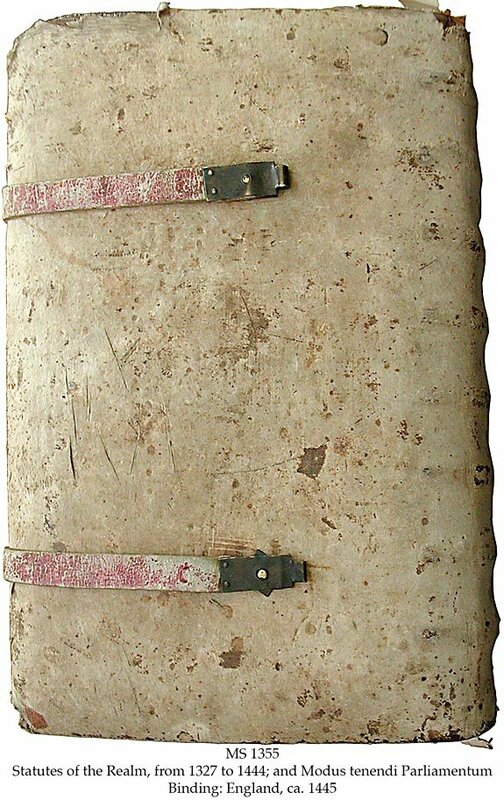 1445, tawed leather (originally pink) over oak boards, sewn on 8 double thongs, blue, green, and yellow head- and tail-bands, 2 pink tawed leather strap clasps from upper board to posts in centre of lower board. Provenance	 1. Richard Chetylbere (ca. 1445); 2. Anna Wylbraham (16th c.); 3. Edward Odierne (until 1592); 4. John Barker, Sibton, Suffolk (1592-); 5. Lord Tollemache and his descendants, Helmingham Hall, Suffolk (-1970); 6. Sotheby's 8.7.1970:67; 7. Frank W. Hammond, London cat. (1970):26; 8. B.J. Webb, Brisbane, Australia; 9. Sam Fogg Rare Books Ltd., London. Commentary	 The only known copy of the Statutes that is signed, and one of the earliest known in Middle English, copied from a rather unique exemplar owned by a member of the Inns of Court or Parliament. 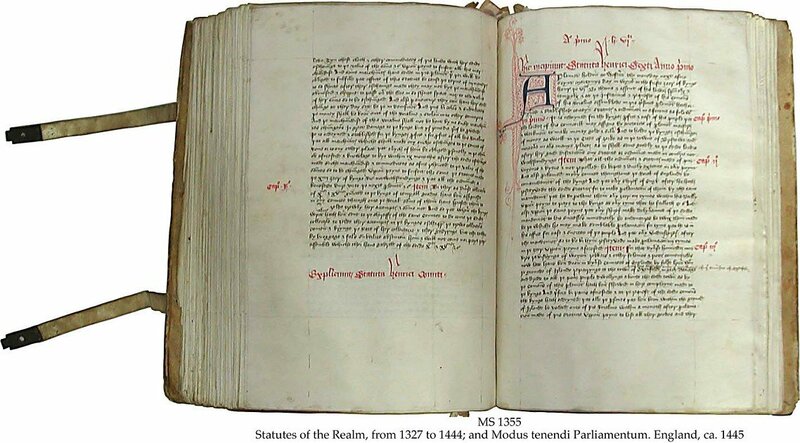 Modus tenendi Parliamentum is widely held to be the most important surviving text for the history of the forms and organisation of parliamentary procedure in England in the Middle Ages. Exhibited	 University of Oslo. Library of Law Faculty: Opening exhibition of Domus Bibliotheca, 5-27 May 1994.